Le Puy, France, is heaven on earth, as I like to call it. It’s where I spent a week this summer as a pilgrim. I first saw the flyer for the pilgrimage when I was headed to class one day at St. Joseph’s College in Clinton Hill, and I knew instantly that I wanted to be a part of that spiritual journey. I applied to be considered for the pilgrimage, not knowing about Le Puy and not knowing much about the Sisters of St. Joseph. I applied because I felt called to. So when I was told I had been selected to go to France, I was joyful, excited and grateful. It felt unreal. It was all in God’s will. Upon landing in France, the fact that I was even there had not registered. My soul was overjoyed. All of us pilgrims, which consisted of two students selected from the nine colleges in association with the Congregation of the Sisters of St. Joseph, along with our wonderful group leaders, were greeted by Sisters Kitty Hanley and Joan Lescinski. I am truly thankful for meeting them. Whether we were having dinner at the Centre International, which is where we stayed during our time in Le Puy, or whether we were touring the little city and all of its lovely sites, every conversation I shared with the Sisters was nice and warm. 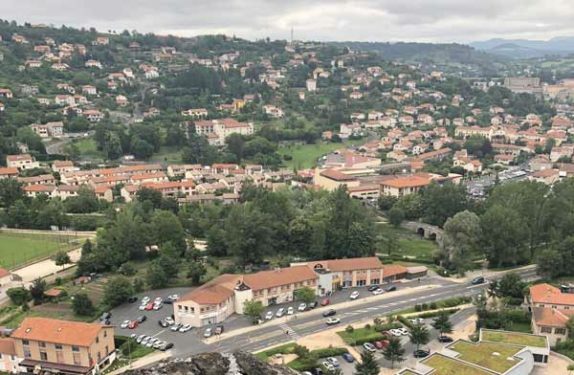 Being in Le Puy allowed me to get more in touch with my spirituality. It allowed me to grow closer to God as I followed in the footsteps of those women who were once called to do the same. I left Le Puy with more peace, more love and a deeper want for Christ. I also left with new friends, great memories, including an encounter with a friendly dog and cat, and meaningful souvenirs. Climbing the mountain to get to the Notre Dame de France statue and then walking within the St. Michel Chapel also perched on a mountain was uplifting. Being in the Notre Dame Cathedral and attending Mass there was life-changing. While there, I was able to write a prayer for my family, buy incense for my father and a Notre Dame prayer card for my grandmother, and have moments of silence alone as I stood in front of a beautiful image of Jesus. Those silent moments were fulfilling. Lyon was the next city visited on this pilgrimage. There we learned about Mother St. John Fontbonne and her humility and great character. How beautiful it was to learn about someone who devoted her life to God. I listened to her story, told by those who know it so well, and I left feeling more motivated to continually devote my life to God and grow with Him, for Him and by Him. Every moment of the weeklong pilgrimage, whether simple or complex, I felt God. 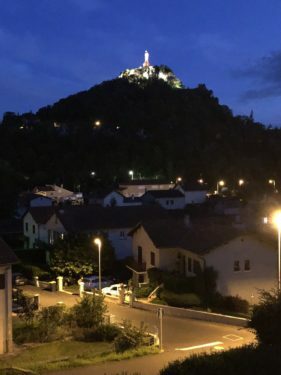 I thank Him everyday for this wondrous experience and I hope many others, including my own family members, will want to visit Le Puy and see its beauty. Being there in person is transforming. Exploring Le Puy and Lyon and learning about the spiritual history makes me want to go on more pilgrimages for myself. 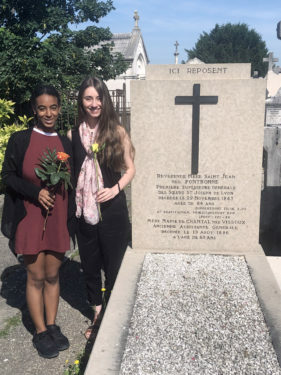 Editor’s Note: The Association of Colleges of Sisters of St. Joseph organized a weeklong pilgrimage for students from each of the Sisters’ nine member institutions to learn more about the Sisters’ history and charism. Veronique Mathieu represented St. Joseph’s College, Clinton Hill. Mathieu graduated from St. Joseph’s College, Clinton Hill, in June, with a bachelor’s degree in English. She aspires to attend medical school.